Discussion in 'Price Check Forum' started by Logi26, Apr 16, 2019. I am just looking for a rough valuation on some games that I have. All of these games came to me on development hardware, but I don't collect game builds. I have not tested these games very much and I have never played the retail version of any of them, so I am not really sure of any differences between these and the retail versions. I have posted some videos and screenshots below. 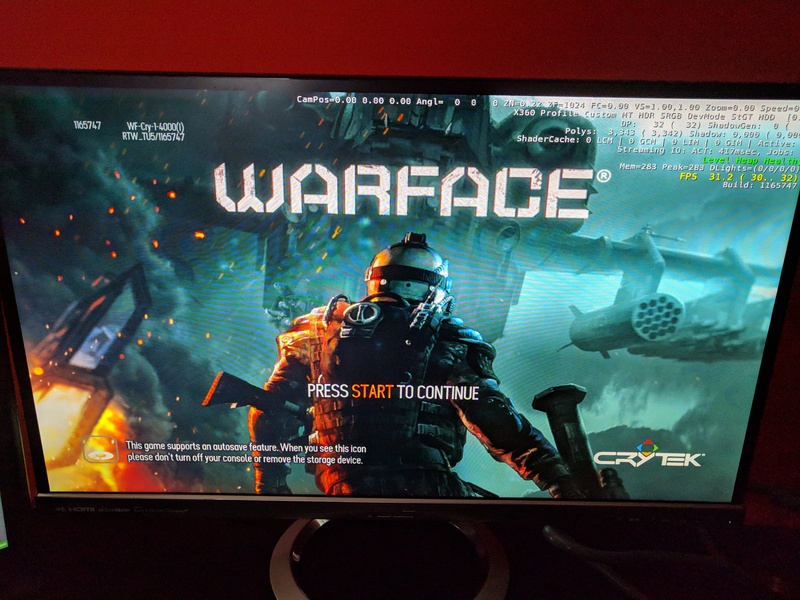 Warface (Build 1165747) might already be dumped? You want a valuation on the builds alone? Or with the hardware they're on? I am just looking for rough prices on the builds themselves with no hardware included. I got these builds with dev hardware and I have since backed them up. But I am not interested in game builds, so these have just been sitting on my backup drive not being used. In some cases I ened up having to pay a little bit more for the hardware because it contained a game build, even though I was not interested in the game. So I am considering selling these to someone that would enjoy them in order to re-coup some of the money that I spent on the hardware. Or maybe swap them for more hardware. But I have no idea what they might be worth. Just to be clear, when I ask what a build is worth, I am talking about a build that would be sold as data and the original would be wiped from my backup drive/devkit and never dumped/resold. No idea for the prices I'm afraid, the markets gone crazy, I'd guess you can get over $1000 for all the data in a bulk lot. It might be worth mentioning what hardware they came from? Burnt Out Cop is a neat one, the design document has been shared previously (and I have a demo document). Dont know that I have the actual build though. Yes, Burnt Out Cop is quit cool. I have only played what is shown in the video, there is probably more to find in the build for someone with interest. The build also includes all of the assets, animations, sounds, models, textures etc. There are different versions of the cop (main character) Cop, CopV3, Test CopV3. There are characters called 'Molester' and 'Squatman'. I like the slighlty racist placeholder logo that they used when the player has the meat clever weapon equipped, just because that is obviously something that you would never normally see in a game and is clear that this build was not intended to be seen by anyone outside the studio. I assume that Burnt Out Cop and TSX will probably be the most valuable of the builds? Because these are games that where never finished/released and there is very little info about either of them online. I would also assume that Beatles Rock Band might be the next most valuable? Since Rockband games seem to have a big following. Anyone know how to determine the build date of a game extracted from an RVT-H? If you want to sell them with the promise that whoever buys them is the sole buyer and you won't make more copies then that's going to be based on trust - and, over the years, these are the kinds of promises we've seen broken when a user registers saying they bought a proto and then the seller sold off more copies without them knowing, etc... It's rare but it has happened. If it's money you're after - then burn a copy and take a chance on eBay. For the unreleased games you could get anywhere from $300 - $800 (that would be my rough guess, maybe a lot more, maybe a bit less) More often than not, it's the 'exclusivity' people are paying for and that's very much in question because it all depends on your sale terms, etc. For the released titles it depends on who's interested in beta copies of the games in question but between $300 - $500... if you find someone who really wants them - and that may take time. Timing and patience is everything. I totally agree, when it comes to the sale of game builds, it is largely based on trust and reputation. I understand what you are saying, but if I did sell the build with the devkit, would this make a difference? There would still be nothing preventing me from re-selling copies of the dumps? This could be said for anyone that sells a devkit with a build included. How do you know they have not kept a dump and will release or re-sell it in the future? I own an RVT Writer and 100+ blank disc's. If I wanted to scam people I could probably make lots of copies of Topspin and Beatles Rockband and sell them on ebay under different accounts. Or I could have put all of the Wii games (4 Rockband builds and 1 Topsin build) onto a single RVT-H and sold it. I could then have put all of those same builds onto another RVT-H and sold that etc. So if I wanted to scam people, there are a number of ways that I could have done it without reveiling my identity. I don't really need the money. I could just keep these on my backup drive. Some have been sitting on there unused for 5+ years. I just thought that someone else would make better use of them and some extra cash towards more hardware would be nice. Plus, I still have a Katana and an AMC DDH which I have not yet checked the hard drives for games. So I may end up finding more. I think your suggestion about burning the data to a disc and putting it on ebay might be my best option. Also, thank you for the rough price guide. Do you still have the output from the rvt h tool used to dump the images? I'm curious if those were debug encrypted on the console. Considering there’s an impending risk of release and/or reselling multiple copies to third parties brings up a big price bargain for the buyer. Another issues is that there’s no assurance that the sources where the kits came from, did not already pull a dump of the data. So in conclusion, I wouldn’t even consider half of the stated lump sums as reasonable to go for..
My estimates are based on what I've seen over the last decade or so... I made it clear they may not be right because there are many variables - but I don't think I'm that far off the mark. If you decide to sell them, then a post here in the eBay thread would be a great way to generate interest and potential buyers - even a heads-up a day or two before they go on sale may help. Yes all of the games that where on my 2 RVT-H systems where debug encrypted. Three of the Rockband builds are labelled as revision 0 and one is labelled as revision 1. Here is the info for both systems. I had to recover these from deleted banks, so it is very unlikely that the previous owner of the consoles has copies of these. The 2 consoles appeared empty when I recieved them and at the time that I bought these, Gerbilsoft's rvthtool had not been released, so there was no way to recover data from deleted banks. Well, as far as I am concerened there is no risk that I will release or re-sell these builds, therfore there is no big price bargain for the buyer. I potentially own the only copies of these unreleased games and if someone does not trust me, then they do not need to by from me. But I am certainly not going to sell these for a bargain price to someone on the basis that they don't trust me. This can be said about every second hand beta/proto, wheather they are on disc or on a development system. But I see builds sell all of the time. I bought some of these dev systems 5+ years ago. If the previous owner has not released anything by now, there is very little chance that they have copies. These builds were actually built to be burned on to a disc, rvth units just happen to support rvm files too. I think it's totally within reason for you to burn them to a disc and resell. Especially considering that the data does not need modified before writing. The Wii stuff is easily worth $50 per game, more if you can demonstrate differences from final. I was originally thinking of doing this, but I thought that if I burnt them to RVT-R disc's there would be even more speculation that I would have produced more than 1 copy of each. That is one of the reasons why I kept the rvthtool print-out. I wanted to be able to prove that there was 4 builds of Beatles Rockband in different banks on the system. Also If I burn the builds to RVT-R disc's, the buyer would need to own an RVT-R Reader to play the disc and they would need to softmod the system if they wanted to backup the data. Wheras if I just sold it as data, the buyer could easily create a backup on their PC. They could also re-sign the game using the rvthtool and the retail keys, which would enable the game to be played on a softmodded retail console. Regardless of the practicality, the builds would likely get more interest if they were burnt to RVT-R disc's. Honestly, just sell them as data. Don't add additional transformations between it. If someone is comfortable buying from you, they will. If they aren't, they wont either way. You're making more work for everyone. Selling homemade copies of development builds is (and for obvious reasons should be) against forum rules, if anybody still cares about those.